I big shout to Doggies at The Beach for taking such good care of my little Diva, Miss Addy. 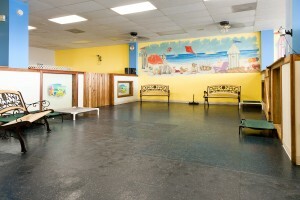 Doggies at the beach is a 3,500 square foot indoor, cage free doggie day care. It is Miss Addy’s home away from home. 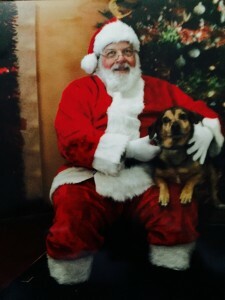 While visiting Doggies at the Beach she met Santa. I know what her expression is telling me, but I am glad she went along with the program. 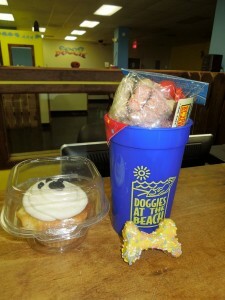 Doggies at The Beach is located at 18806 J. Williams Hwy. in Rehoboth Beach. Tel. 302-644-8200. They have 24 hour human supervision and even web cams so that you can follow your precious pooch. Grooming is also available. They are on Facebook, as well. Check them out because they are always hosting events and very much involved in the community. Jim and his staff are very caring and obviously they love dogs!! 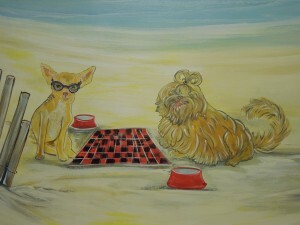 Please visit http://www.doggiesatthebeach.com. This would be a great stocking stuffer for your dog. 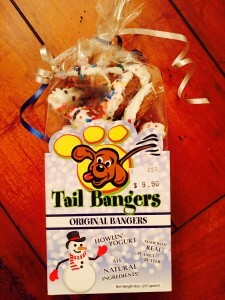 Your pooch will love these Tail Bangers made with whole wheat flour, rolled oats, eggs, canola oil, fresh ground peanuts, honey, cinnamon, with a vanilla yogurt coating. Tail Bangers are made in Millsboro, Delaware, about 1/2 hour from Rehoboth Beach. The company has gone big, a success story. I have not visited but can’t wait to do so. You can find Tail Bangers at Doggies at The Beach, Candy Kitchen, Pet Stores in the area and even the UPS store at the Safeway Shopping Center. I took them as a gift to my friend’s dog, Dale, in Bluffton, South Carolina and they were a big hit. So, I decided to try them myself. They smell so good. I took a bite and they were not bad at all. After all they are made with all natural ingredients. Tail Bangers is located at 24546 Betts Pond Rd., Millsboro, DE 19956 You can find them on Facebook and Twitter. Website? www.tailbangers.com. Another great stocking stuffer for those that love to cook and for your favorite foodies are these Sea Salts made right here on the coast by SoDel Concepts. There is the Bay Spice, the Summer Lemon Zest, and the Black Pepper Fennel. 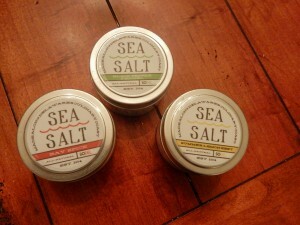 You can get these salts at any of SoDel Concepts Restaurants from Lewes to Fenwick Island. For the locations of the restaurants, please visit http://www.sodelconcepts.com. Or, you may also get it at http://www.amazon.com. Anyone complaining about the weather…oh, it might be a little hot, right? Looking forward to the official opening of Summer 2015!! So, What’s Going On? Wednesday, 5/13 – WEDNESDAY BUSINESS MIXER at The Pond Bar & Grill, located at 3 South First Street in Downtown Rehoboth Beach. Tel. 302-227-2234. Website? 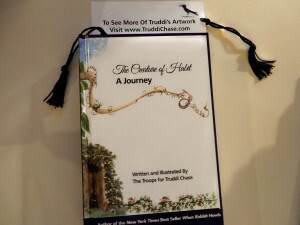 http://www.thepondrehoboth.com. It is an exciting Wednesday at The Pond when they welcome back Doggies At The Beach and Saved Souls Animal Rescue as their sponsor for today’s Business Mixer. FREE Buffet, FUN Prizes, and ENTERTAINMENT. Mixers are open to the public. Doggies At The Beach is a premiere 3,500 square foot indoor cage free, doggie day care with the goal that all doggies in their care have a fun, clean, and safe environment. Webcams are available so you can watch your adorable pooches via the internet. 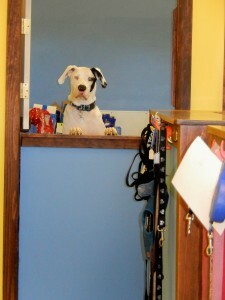 Please visit http://www.doggiesatthebeach.com so that you can see all the services they offer. It is my Addy’s only place to stay when I am away. Saved Souls Animal Rescue is an amazing organization that transports, fosters, and adopts animals in need. Their goal is to help animals find forever homes. This is local!! They foster animals at their homes until they can find their “furever” home. More info? Please visit http://www.savedsoulsanimalrescue.com. Friday, 5/15 – SOUTHERN DELAWARE FOR NEPAL – 15 Restaurants on May 15th will donate a portion of their proceeds to the Nepal Disaster Relief. http://www.savethechildren.org. SODEL Concepts, started by the late Matt Haley is including all of their restaurants: Bluecoast, Catch 54, Papa Grande’s Coastal Taqueria in Fenwick, Papa Grande’s Coastal Taqueria in Rehoboth Beach, Lupo in Rehoboth, Northeast Seafood Kitchen, Fish On!, Matt’s Fish Camp, Plate Catering, Big Thunder Roadside Kitchen. Others like DiFebo’s Italian Grille in Bethany and the newly opened DiFebo’s Italian Grille in Downtown Rehoboth Beach, Claws, Fins (both locations), and Nage. Saturday, 5/16 – REHOBOTH BEACH WALKING TOURS – The Rehoboth Beach Historical Society Kicks off its Walking Tours this Saturday at 9 a.m. at the Rehoboth Beach Bandstand. 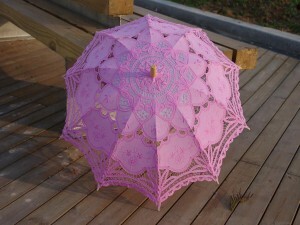 Look for the pink lace umbrella held by tour guide Jean Brolund. The tour is a 45 minute gentle stroll around Downtown. The cost of the tour is $10. 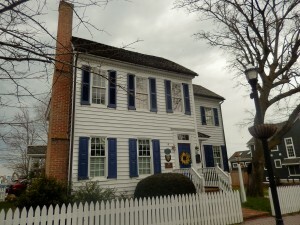 Reservations are required and may be obtained by calling the Rehoboth Beach Museum at 302-227-7310. These tours provide general information about the history of Rehoboth Beach, while touching on several of the Storms that have shaped the coastline and the beachfront town. There will be a total of 12 tours this year. Please visit http://www.rehobothbeachmuseum.org. Sunday, 5/17 – REHOBOTH BEACH MUSEUM HOSTS NEEDLEWORK SAMPLER TALK – Sunday, at 2 p.m. at the Museum located at 511 Rehoboth Avenue. Refreshments will be served and reservations are required by calling 302-227-7310. 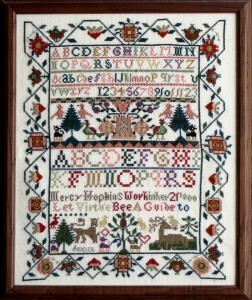 For centuries, samplers provided a major part of a young girl’s education. Young ladies learned the alphabet, and how to cout to ten; all that was considered necessary for them to know at the time. Today, girls are educated, and samplers are appreciated for their part in helping us to learn about this part of our past. Nationally-known needlework expert, Dolores Andrew will present this lecture. She is a National Academy of Needlearts certified judge and author of books and historic needlework. She has completed graduate study in Italian Renaissance embroidery and research in lesser known media such as Casalguidi and white work. Destination? 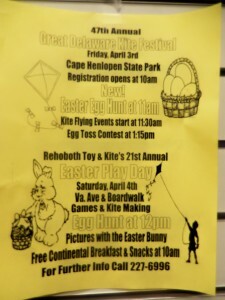 Historic Lewes, Delaware, Activities, Events, Delaware Beaches, Southern Delaware, 47th Annual Kite Festival, Egg Hunts, Yappy Hour!! A little historical trivia never hurts….Since Lewes was the earliest settlement in the State, and Delaware was the first state to ratify the Constitution, the town is known as The First Town in The First State. 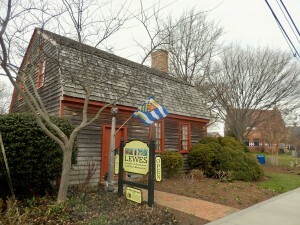 Lewes is named after the town of Lewes in England, located in Sussex, from which Sussex County, Delaware takes its name. Lewes, Sussex, England, also has the same seal. It has been a long time since Lewes rolled up its streets after the summer season until the next year. This town is a vibrant community with plenty of restaurants, unique boutiques, museums….and so walkable. 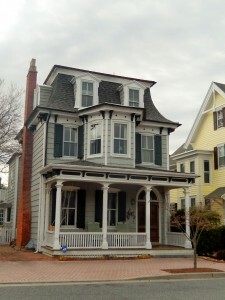 As you stroll Lewes check some of the homes with beautiful architecture. Friday, April 3rd – 47th Annual Great Delaware Kite Festival. 10 a.m. until 3 p.m. at Cape Henlopen State Park. New this year is the Eastern Egg Hunt at 11 a.m. The Egg Toss will begin at 1:15 p.m. More info? 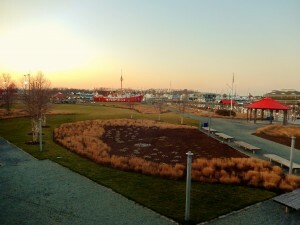 Please visit http://www.leweschamber.com/event/great-delaware-kite-festival. Friday, April 3rd – Gallery Espresso Coffee House Bistro located at 12001 Old Vine Blvd. in Lewes will be hosting the Yappy Hour!! 5 p.m. until 7 p.m. Doggies at the Beach will be there. Please stop by say hello, mingle and meet others. 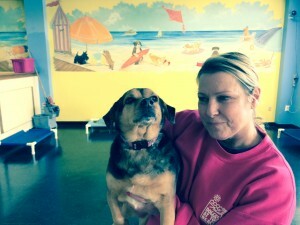 For information on Doggies at The Beach, please visit http://www.doggiesatthebeach.com. 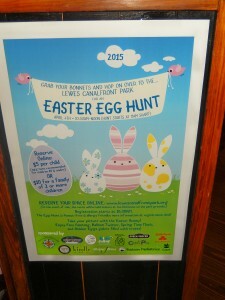 Saturday, April 4th – Lewes Canalfront Park is the perfect spot for an Easter Egg Hunt. Registration begins at 10:30 a.m. You can also register online, http://www.lewescanalfrontpark.org The Hunt will begin at 11 a.m. and the event will be until Noon. The Egg Hunt is Peanut Free and Allergy friendly. More info at the registration desk. There will be photos with the Easter Bunny, Face Painting, Balloon Twisting and Spring Time Music!! Have a great Easter Week-End!! Comments Off on Destination? Historic Lewes, Delaware, Activities, Events, Delaware Beaches, Southern Delaware, 47th Annual Kite Festival, Egg Hunts, Yappy Hour!! Destination? 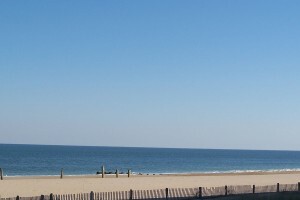 Delaware Beaches, What’s Going On?, Events, Activities, Southern Delaware, Lewes, Rehoboth Beach, Dewey Beach, Bethany Beach, Fenwick Island…Waiting for Summer!! 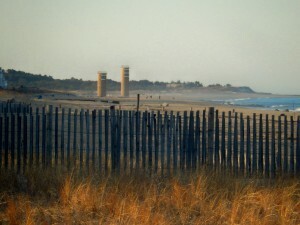 On March 19, 1891 it was first called Cape Henlopen City. In 1893, the name was formally changed to Rehoboth. 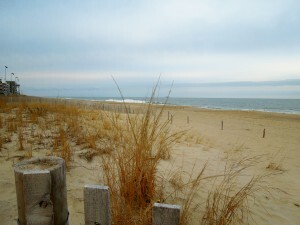 Since then, Rehoboth Beach has been welcoming thousands of visitors not just in the summer, but year round. It is a destination for many, and for a lot of us, it is also home. Living at the beach is great, and, believe me, I do not take it for granted. The beaches are stirring, businesses are sprucing up. So, What’s Going On? 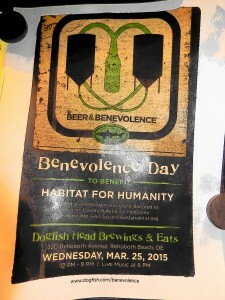 Wednesday, March 25th – BENEVOLENCE DAY-Beer & Benevolence at Dogfish Head located at 320 Rehoboth Ave. in Downtown Rehoboth Beach. Noon until 9 p.m. with Live Music at 6 p.m. This is a benefit for Habitat for Humanity. More info.? Please visit http://www.dogfish.com/benevolence. 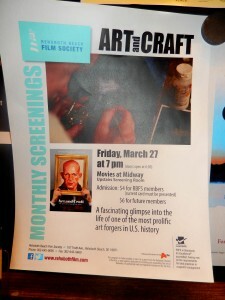 Friday, March 27th – ART AND CRAFT – The Rehoboth Beach Film Society is presenting a fascinating glimpse, with this film, into the life of one of the most prolific art forgers in U.S. history. Location? 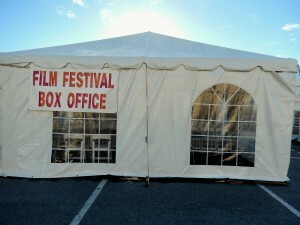 Movies at Midway located on Coastal Highway at the Upstairs Screening Room. $4.00 for RBFS members and $6.00 for future members. More info.? Please visit http://www.rehobothfilm.com. Theater in Downtown Rehoboth Beach!! – CLEARSPACE THEATRE CO. presents: Comedy, a musical comedy until April 5th. 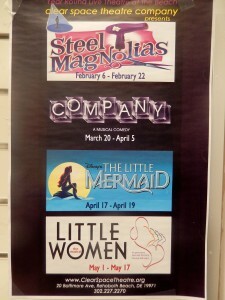 The Little Mermaid from April 17th until April 19th. Little Women from May 1st until May 17th. Clearspace Theatre Co. is located at 20 Baltimore Ave. in Downtown Rehoboth Beach. For tickets and info., please visit http://www.clearspacetheatre.org. You may also call 302-227-2270. Friday, April 3rd – 47th ANNUAL GREAT DELAWARE KITE FESTIVAL – Location? 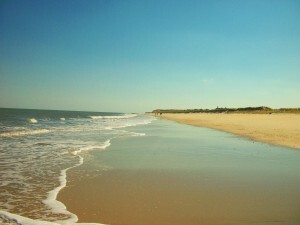 Cape Henlopen State Park in Lewes. Registration opens at 10 a.m. EASTER EGG HUNT at 11 a.m. Kite flying events start at 11:30 a.m. and the Egg Toss Contest starts at 1:15 p.m.
Wednesday, April 8th – READ A MOVIE – The Rehoboth Beach Film Society and the Rehoboth Beach Public Library invite film and/or literary enthusiasts to Read a Movie screening of “The Duellists” at 4 p.m. in the upstairs community room of the library. Based on the short story, “The Duel” by Polish-born writer Joseph Conrad, this film depicts a historically accurate account of early 1800s France. This screening is part of the monthly Read a Movie series in which members read a little-known short story in advance of the screening, then gather to watch the film and share their thoughts about how well or not so well the story was expanded to the big screen. To sign up and receive the stories in advance, email Denise Hoban at outreach@rehobothfilm.com. 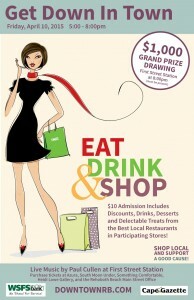 Friday, April 10th – 5TH ANNUAL “GET DOWN IN TOWN” – Shop & Eat…all for a good cause!! 5 p.m. until 8 p.m. everyone is invited to downtown Rehoboth Beach for this event. Shoppers will enjoy special discounts in participating stores while noshing on local restaurants’ desserts, treats and drinks dispersed throughout stores. Food served from 5 p.m. until 7 p.m. Shopping until 8 p.m. There is a $10 admission fee to participate in this one night event, which also includes a chance to win a Grand Prize Drawing valued over $l,000. The Drawing will take place at 8 p.m. at First Street Station Courtyard and the recipient must be present to win. Tickets can be purchased the night of the event. 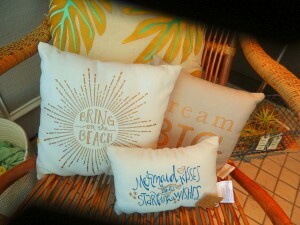 Or, ahead of time at Azura Clothing, Heidi Lowe Gallery, Rehoboth Beach Main Street Office, Something Comfortable, South Moon Under and online at http://www.downtownrb.com. 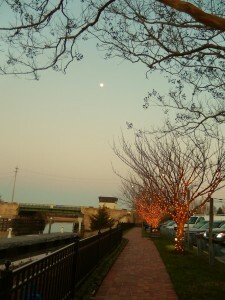 There is no better place where you can wine, dine, walk and shop than Downtown Rehoboth Beach!! 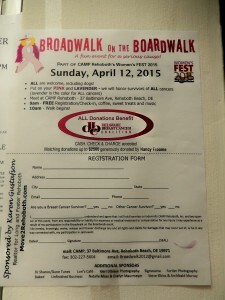 Sunday, April 12th – BROADWALK ON THE BOARDWALK! A fun event for a serious cause. Part of CAMP Rehoboth’s Women’s FEST 2015! All are welcome, including dogs. Put on your Pink or Lavender. They will be honoring survivors of ALL cancers. Lavender is the color for All Cancers. Meet at CAMP Rehoboth on 37 Baltimore Ave. at 9 a.m. Free registration. Check in, coffee, sweet treats and music. Walk begins at 10 a.m. All donations will benefit the Delaware Breast Cancer Coalition. Cash or checks accepted. Matching donations up to $2,500 generously donated by Nancy Froome. 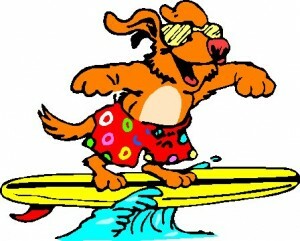 Sunday, April 19th – DOGGIES AT THE BEACH CUSTOMER APPRECIATION DAY COOK-OUT. Noon until 2 p.m. at Doggies at The Beach, located at 18806 John J. Williams Hwy. (Rt. 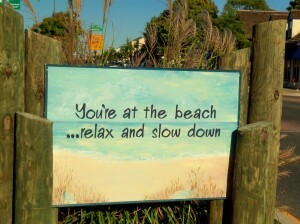 26) in Rehoboth Beach. 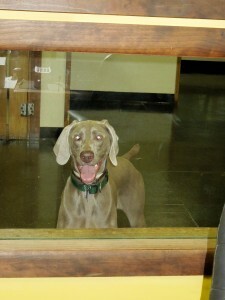 This is a cage free dog boarding facility, where I leave my pooch, Miss Addy. 24 hour human supervision!! More info? http://www.doggiesatthebeach.com. Tel. 302-644-8200. Friday, April 24th – REHOBOTH BEACH FILM SOCIETY APRIL’S MONTHLY SCREENING – RBFS presents this year’s Academy Award nominees for Best Animated Short Film. The screening will be held at the upstairs screening room at Movies at Midway on Coastal Highway. Doors open at 6:30 p.m. A rare opportunity to enjoy one of the most entertaining categories at the Academy Awards-Best Animated Short Film. Me and My Moulton, Feast, The Bigger Picture, A Single Life and The Dam Keeper. Admission is $4 for members and $6 for future members. Tickets will be sold at the door to each screening on a first come, first serve basis. 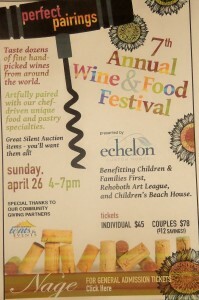 Sunday, April 26th – 7TH ANNUAL WINE & FOOD FESTIVAL – PERFECT PAIRINGS – A benefit for Children & Families First, Rehoboth Art League, and Children’s Beach House. Tickets are $45/person or $78/couple. 4 to 7 p.m. Taste dozens of fine handpicked wines from around the world, artfully paired with their chef-driven unique food and pastry specialties. 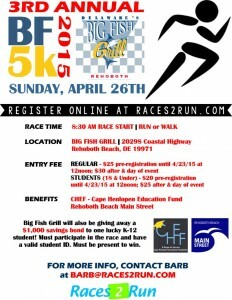 Sunday, April 26th – BIG FISH GRILL 5K TO BENEFIT LOCAL COMMUNITY – 3rd Annual event. Race start for runners and walkers is 8:30 a.m. in front of Big Fish Grill on Rt. 1. Big Fish Grill will be donating portion of the proceeds from this event to local nonprofits CHEF (Cape Henlopen Educational Foundation) and RBMS (Rehoboth Beach Main Street). In addition, all students (K-12) who participate are eligible to win a $1,000 savings bond. You must be present to win and have student ID. Pre-registration is $25, until 4/23 at noon. Registration from then through Race Day is $30. Student (18 and under) Pre-Registration is $20, until 4/23 at noon. Registration from then through Race Day is $25. Register online at http://www.races2run.com. For more info., please contact Barb@races2run.com. 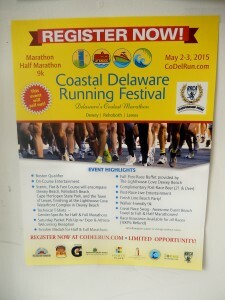 Saturday, Sunday, May 2nd, May 3rd – COASTAL DELAWARE RUNNING FESTIVAL – Marathon, Half Marathon…Delaware’s Coolest Marathon – Dewey, Rehoboth, Lewes. It is a Boston Qualifier. Scenic, flat and fast course will encompass Dewey Beach, Rehoboth Beach, Cape Henlopen State Park, and the Town of Lewes, finishing at the Lighthouse Cove Waterfront Complex in Dewey Beach. Full post race buffet provided by The Lighthouse Cove Dewey Beach. Complimentary post race beer for those 21 years of age and older. To register visit http://www.codelrun.com. Saturday, May 9th – TREASURE YOUR CHEST BREAST CANCER 5K RUN/3K WALK IN BETHANY BEACH…Rain or shine!! Fundraising for Little Pink Houses of Hope and Vance Kane Memorial Fund/Beebe Medical Foundation. Pre-registration $25, Kids $15 (under 10 years of age). Online registration closes April 10th. Prizes for Most Spirited Outfits…Dress in Your Best Pirate Gear. Team, Individual, Strollers, Wheelchairs, Dogs….T-Shirts Guaranteed only to those pre-registering. 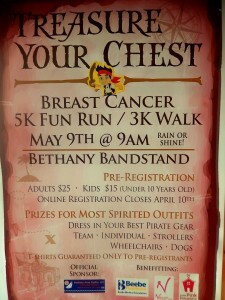 For registration and more info., please visit http://www.bethanybeachbreastcancer.com. 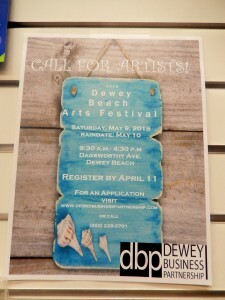 Saturday, May 9th – DEWEY BEACH ARTS FESTIVAL – Rain Date? Sunday, May 10th. 9:30 a.m. – 4:30 p.m. Location? Dagsworthy Ave in Dewey Beach. For an application, please visit http://www.deweybusinesspartnership.com, or call 302- 228-3701. 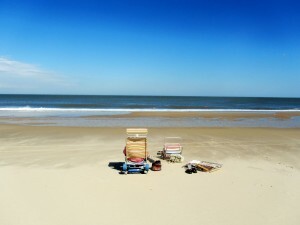 Hey…I stand corrected, the Delaware Beaches are not stirring…..they just woke up!! Time to play! Have a good one. Doggies at The Beach, Rehoboth Beach, Delaware, Dog Boarding, Overnight Care, Day Care, Web Cams, Grooming, Training, 24-Hour Human Supervision, Cage Free, No Kennels, Climate Control, Happy 8th Anniversary to Doggies at The Beach!! In 2009 I adopted Miss Addy. I call her my princess, best in show, the best and most beautiful dog in the world…all kinds of silly names. 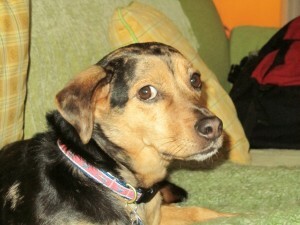 Miss Addy is a mutt and a “rescue”. I think she was about a little over a year when I adopted her. Here is her photo. She is a little Diva now. She learned quickly. Word of mouth is everything. So, when my friend, Renee told me about Doggies at The Beach, I thought it would be the perfect place to leave Miss Addy when I was traveling for a day or overnight. It would give me a piece of mind. Not everyone can or want to travel with their pooches, so be sure when I tell you that they will be well taken care of at Doggies at The Beach. 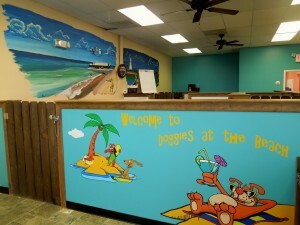 Doggies at The Beach is located at 18806 John J. Williams Highway (Rt. 24) in Rehoboth Beach, DE 19971. Tel. 302-644-8200 Website? http://www.doggiesatthebeach.com. Doggies at The Beach is open 7 days a week. You can leave your dog for overnight care, day care, and grooming. Throughout the year they hold training classes and they also hold vaccination days at a discount rate. At times, when I come in the customers make me laugh. Here are some of the photos. There are no cages here. What they do have are 6 separate play areas that are small, medium and large. 24-human supervision is one of the services that they are so proud of. They play with the dogs, take them out for walks and give them a treat here or there, as well. With 3,500 square feet they have plenty of space for all their customers to have a good time. They will be comfortable since the location is climate controlled and with purified air. There are 5 web cams….just in case you want to follow your pooches daily activities. Names like Little Dippers, Moon Doggies, Big Kahunas are the names they give to the play areas which are assigned according to size. They even have a Puppy Palace, just in case your pooch demands a suite. The last day of your adorable pet stay, they will give him or her a bath…a scarf and they will be ready to go. Miss Addy just spent a week at Doggies at The Beach, while I was in Charleston. My cousin was so jealous because where she lives she does not have this type of care for her dog. So, when I got a few texts from Doggies at The Beach sending me photos of Miss Addy….she was like….what? Before you start leaving your pet at Doggies at The Beach there are procedures to follow. A temperament evaluation…no agressive dogs, please. Shots and any other pertinent info. Best if you call them at 302- 644-8200. HAPPY 8TH ANNIVERSARY TO DOGGIES AT THE BEACH!! An anniversary with plenty of Events. So, What’s Going On? Friday, April 3rd – Local Buzz Happy Hour – 5:00 p.m. to 7:00 p.m. at Gallery Espresso located at 12001 Old Vine Blvd., Lewes. Doggies at The Beach will be displaying their stuff. Please stop by and check them out. Sunday, April 19th – Doggiest at The Beach Customer Appreciation Day Cook Out from Noon until 2:00 p.m. at their location on Rt. 24 or 18806 John J. Williams Hwy. in Rehoboth Beach. Doggies are welcome with their Humans!! There will be a Photo Booth, Food, Drinks, Door Prizes and the Doggie Mascots will be there, as well….In other words, lots of fun!! 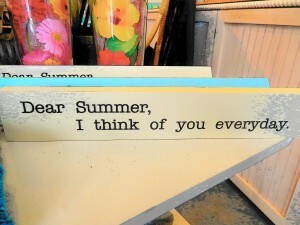 Wednesday, May 20th – Frogg Pond Customer Appreciation Night at 3 South First St. in Downtown Rehoboth Beach. 6:00 p.m. until 8:00 p.m. Food and Entertainment. Please note that this event is not for the doggies….just you. So, as you can see it is pretty nice. Keep it in mind if you are bringing your pooch to the Delaware Beaches. You might want to call and schedule his or her stay ahead of time. On another note…Jim and his staff at Doggies at The Beach are so involved in the community, here at the Delaware Beaches. They help raise funds for charitable organizations and I think the world of them. If you think your dog is just not having fun, think again, because he or she might might be having more fun!! Talk to you later. Comments Off on Doggies at The Beach, Rehoboth Beach, Delaware, Dog Boarding, Overnight Care, Day Care, Web Cams, Grooming, Training, 24-Hour Human Supervision, Cage Free, No Kennels, Climate Control, Happy 8th Anniversary to Doggies at The Beach!! Five years ago I was sitting at Hobos located at Baltimore Avenue in Downtown Rehoboth Beach, when my husband suggested I started a website. To tell you the truth I think he was tired of me calling him to the office to tell him I had found a better place to get corn, or that the crabs were bigger at such and such place…..and can you believe they are putting another bla bla bla store here? I fell right into it. But from a website it went to a website written in a blog style. Living at the beach is great. I never take it for granted. And, for so many years John and I lived here at the Delaware Beaches. He could have written the blog himself also. I guess being residents of the “Beaches” gave us the ability to pass on the information….at times maybe too much information. For the ones that follow my blog, there are over 43,000 photos. 5 years worth of photos. My family is still not at ease by my taking photos of the food at restaurants. They say that is so embarrassing. My friends? They are more forgiving. They humor me and don’t dare to start eating until the photo or photos are taken. John was my best PR person. He always carried AboutMyBeaches cards in his wallet. But, John passed away last August. Yes, that’s the way life goes; not fair. He had a very dry sense of humor and I am sure he is watching what I am writing and what I am eating. He was the first foodie I knew. We miss him so much. My advertisers are great, just click on their website located on the right hand of this post. I do know them personally. I want to thank them by including them on this post. 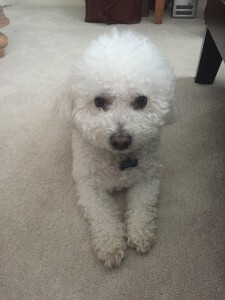 DOGGIES AT THE BEACH – This is my dog’s, Addy, home away from home in Rehoboth Beach. 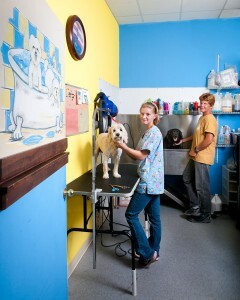 Cage free facility, grooming, classes and the best staff ever. Call them at 302-644-8200. BUTTER SHADES – Quality affordable sunglasses. A traditional and classic look that anyone can wear. Internet sales…just check out the website, place your order and in a few days you will get them. Follow Butter Shades on Facebook. BETHANY AREA REALTY, LLC – The Broker of Record for Bethany Area Realty is Ann Raskauskas. I call her Annie. My husband and I knew her well. For many years she worked with my husband at Tidewater Realty. They were best friends. Annie, just like John did, loves to sell the lifestyle that they both enjoyed. Annie is also involved in fundraising for charities that are close to her heart. For rentals and sales, contact her at 302-537-9700. What can I say…thanks to all the readers!! I have over 11,400 page views, 1,696 posts, 2,028 comments, 7,906 tags and plenty of spam. I post on Twitter and AboutMyBeaches has a Facebook page. Soooo….I will be talking to you later. Come closer…May I help you? Without a shadow of a doubt, Shadow, was eager to help as I stepped into Doggies at The Beach located at 18806 John J. Williams Highway, or Rt. 24 in Rehoboth Beach, Delaware. 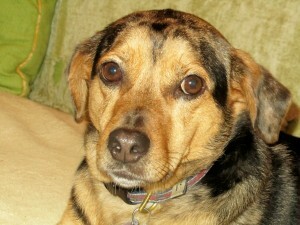 My Heinz 57, Addy, won the “Valentine”s Day give-away. How exciting! Addy will be getting complimentary Daycare and Grooming, and she has until December of 2014 to use. That won’t be a problem because when I need to leave the area, Doggies at The Beach is home away from home for Addy. 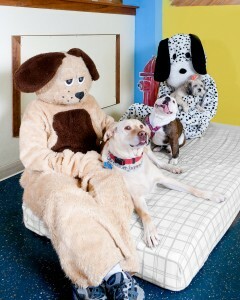 I have written plenty of times about this doggie day care facility. It is cage free with 24/7 human supervision. 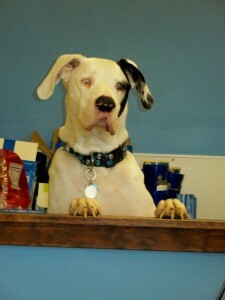 They offer day car, overnight care, training courses, and lots of love. Tel. 302-644-8200. Website? http://www.doggiesatthebeach.com. You can also follow them from your computer since they have webcams. These other customers were there and I had to take their picture, as well. They are a family and they moved in unisome. Almost like saying “okay we stay together when at daycare”. Too funny. And here is the winner…Addy!! 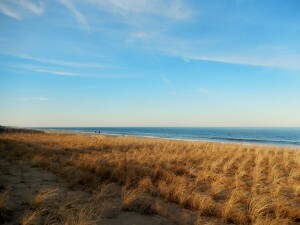 Getting away from it all…that’s the beauty of heading to the Delaware Beaches. For the ones that make Rehoboth Beach their home, it is a special time during the Second Season when we get to roam the town. 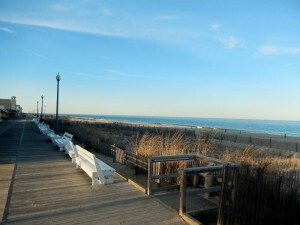 Rehoboth Beach is a year-round resort, where restaturants, shops, and entertainment are part of its charm. So, What’s Going On? NEWS – The 16th anniversary of the Rehoboth Beach Independent Film Festival was record-breaking, with 19,133 seats filled and 59 screening sell-outs! Best Debut Feature: Touch of the Light. I saw this film and was amazing with a beautiful message. 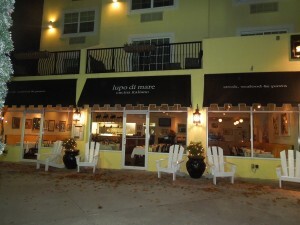 Tuesday, 11/19 – WOMEN AND WINE AT LUPO DI MARE – Location? 247 C Rehoboth Avenue in The Hotel Rehoboth in Downtown Rehoboth Beach. Fundraising dinner event for the Alzheimer’s Association. It is the world’s leading voluntary health organization in Alzheimer’s care, support, and research. Each course will be paired with the perfect wine. The event is limited to 65 guests. Doors open at 6:30 p.m. with dinner being served at 7:00 p.m. $39/person, gratuity is not included. Please call Mike Dickinson at 302-226-2240 and make your reservation. Until November 20th – AUDIENCE APPRECIATION DAYS – CLEAR SPACE THEATRE COMPANY – FREE PERFORMANCES. Location? 20 Baltimore, Ave. in Downtown Rehoboth Beach. Tuesday, 11/19 at 5:30 p.m. – Our Kids Have “Heart”! – Meet some of their younger performers from the Broadway Bound, Gotta Dance!, and Children’s Acting Technique classes as they deliver song and dance. Wednesday, 11/20 at 11 a.m. – Broadway Legends: Chicago – The Legends of Broadway students, ages 50+, invite the public to attend their FREE concert production of Chicago. All of the songs and memorable characters are intact with some choreography and scenes taken directly from the original Broadway script. An American Christmas Carol returns to Clear Space from November 29th until December 2nd. Friday and Saturday at 7:00 p.m. and Sunday at 3:00 p.m. General Admission is $30, Seniors, $25, Student/Child, $15. Group sales of 20 or more save 20%. Call 302-227-2270. You can reserve your tickets online by visiting http://www.clearspacetheatre.com. Friday, 11/22 – Sunday, 11/24 – FESTIVAL OF TREES AT REHOBOTH BEACH CONVENTION CENTER – This is a fundraising event for Delaware Hospice. This annual event opens the holiday season statewide. 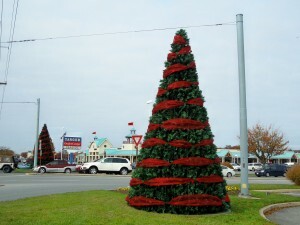 The festival features a magnificent display of decorated trees and wreaths, offers special holiday events, and hosts thousands of visitors each year. Friday Night on 11/22 from 6:30 p.m. to 9:30 p.m. is called “Holiday Gala”. Saturday Night, 11/23 from 5:00 p.m. until 7:00 p.m. is called “Making Spirits Bright”. General Admission begins at 10 a.m. until 9:00 p.m. on Saturday, 11/23 and on Sunday, 11/24 at 10 a.m. until 2:00 p.m. There will be The Sweet Shoppe with baked goods donated by Delaware Hospice supporters, The Craft Elves Holiday Gift Shoppe with an assortment of handmade craft items, holiday gifts and decorations, Raffles with a large selection of gift items and plenty more. Location? 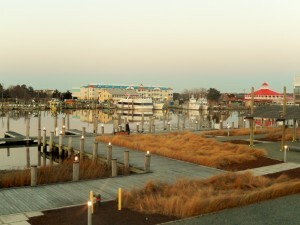 The Rehoboth Beach Convention Center at 229 Rehoboth Ave. in Downtown Rehoboth Beach. For more info. please visit http://www.delawarehospice.org. 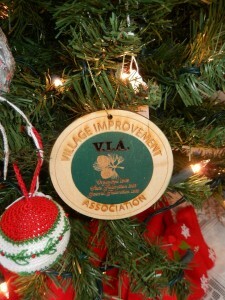 Friday, 11/22 – VILLAGE IMPROVEMENT ASSOCIATION WINE TASTING – 6 p.m. until 8 p.m. at the Clubhouse on 415 N Boardwalk. $20 per person. RSVP 302-227-1631. 6 Premium wine tastings with food by Touch of Italy. It will benefit the Capital Campaign. Door Prizes!! The VIA is a 501c3 organization dedicated to the improvement of the community. 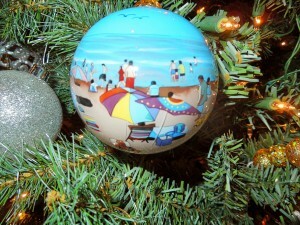 Saturday, 11/23 – GOOD EARTH MARKET REHOBOTH BEACH – “Our Favorite Holiday Artisians Market” – 10 a.m. until 2 p.m. Unique gifts for the holidays made with love and great talent. 6 crafters/artists and FREE snacks!! Location? 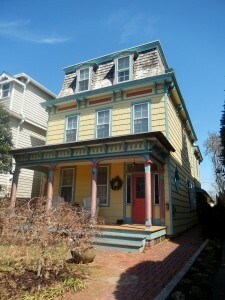 38131 Terrace Rd., Rehoboth Beach (the forgotten mile). Please remember that their coffee bar, Gem Java opens from 8 a.m. until Noon. 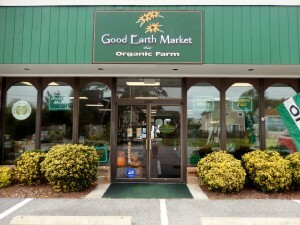 Check Good Earth Market Rehoboth Beach on Facebook. Tel. 302-226-3276. 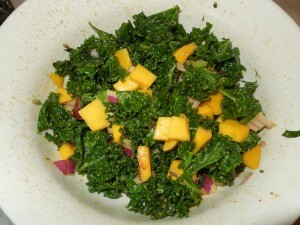 Kale & Mango Salad. The Best!! Sunday, 11/24 – 1ST ANNUAL REHOBOTH BEACH “THANKS-LIVING DINNER” – A VEG CELEBRATION FOR ALL! – Location? 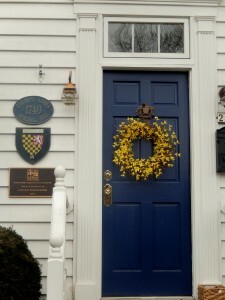 CAMP Rehoboth at 37 Baltimore Avenue in Downtown Rehoboth Beach. Time 3:00 p.m. This dinner is presented by VegRehoboth. Tickets are $20/person. You will be presented with a chef created Vegan meal…foods from Hobo’s, a(MUSE), Cabo, and Modern Mixture. A complimentary glass of wine and live music. Proceeds will support VegRehoboth’s advocacy work and Rehoboth Beach VegFest. 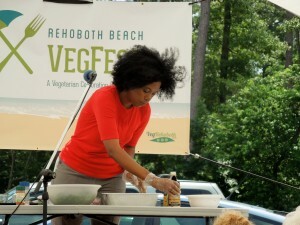 This past summer I attended the 1st Annual Rehoboth Beach VegFest and I am certainly looking forward to the one next year. One of my favorite salads? Kale & Mango by Dr. Ruby Lathon. Tickets are available at the following locations in Downtown Rehoboth Beach: a(MUSE), Azura Clothing, Cabo, Hobo’s, Modern Mixture. Tickets can be purchased with cash or check. Make checks payable to “VegRehoboth”. Grooming Special: Your pet needs to look the best for the Holiday Season and Doggies at the Beach is offering a Grooming Special until November 24th. Buy one grooming session until 11/24 and receive the 2nd at 50% off. It expires 12/24. Advance reservations are needed. 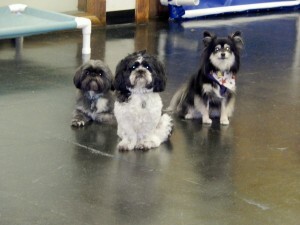 Doggies at the Beach has 3 Master Groomers, open 7 days a week!! Dog food donations for SPCA Georgetown…they also accept cat food. Slightly used Sweatshirts….Epworth Church is having a Complimentary Thanksgiving Dinner for those in need. Doggies at the Beach is happy to collect them and transport to Epworth. Hope you had a Great Day! !